Colorado State University-Global Campus is a 100% online public university, offering innovative higher learning opportunities for nontraditional students and working adults. Specializing in bachelor's degree completion and graduate degree programs- as well as offering a large number of Certificates of Completions- CSU-Global is committed to providing the very best education opportunities to students in a convenient, flexible environment at an affordable tuition rate. Click here to learn more about the CSU-Global and NJCTL partnership. NJCTL students who want to register for courses at CSU-Global should contact the Enrollment department at 1-800-920-6723 or visit CSUGlobal.edu for more information on start dates and registering for courses. Make sure to mention that you are a NJCTL student! Students who are interested in transferring their NJCTL credits to CSU-Global should contact CSU-Global directly. The student will need to request an official transcript from NJCTL so CSU-Global can verify the courses were taken and passed. 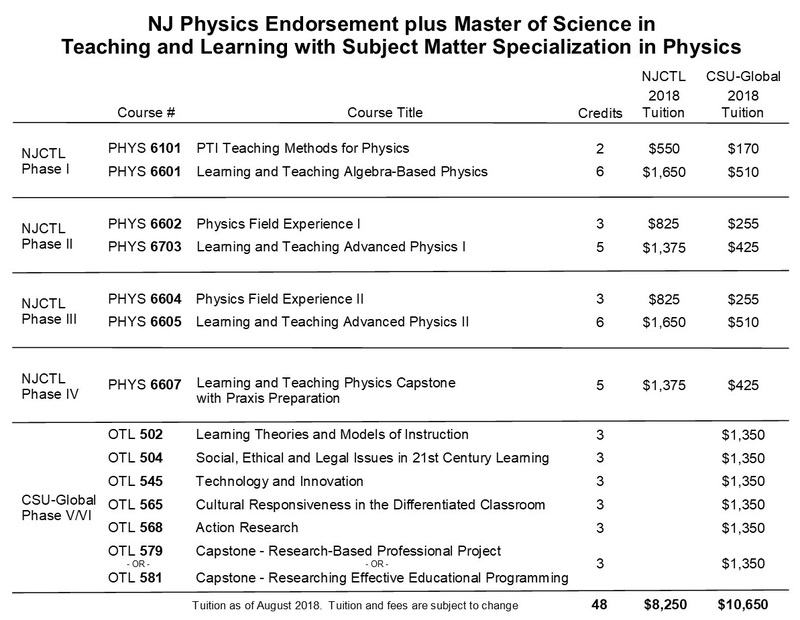 If a student takes all the listed courses they can transfer 18 credits towards a Master of Science in Teaching and Learning (MSTL) Degree: 12 credits towards the MSTL Subject Specialization plus 6 credits towards the MSTL Core Degree. CSU-Global charges a transaction fee of $85 per credit hour. The tuition rate for the Master's program is $450 per credit hour. More information about the MSTL program can be accessed by clicking here. Reach an Enrollment Counselor by visiting CSUGlobal.edu or dialing 1-800-920-6723. Graduate Students Graduate applicants who have earned a bachelor’s degree at a non-U.S. institution must have their transcripts reviewed by an approved evaluation service in order to be considered for admission. Official transcript evaluations must be sent directly from the evaluation service to CSUGlobal. Approved evaluation services are listed at http://www.naces.org/. Transcripts evaluated by AACRAO (http://www.aacrao.org/) are also accepted. As a minimum, the evaluation must indicate equivalency to the completion of a bachelor’s degree from a regionally-accredited university and include cumulative GPA. The internet-based or paper-based version of the Test of English as a Foreign Language (TOEFL). A minimum score of 60 on the Internet exam, 173 on the computer exam, or 500 on the paper exam is required for admittance. The International English Language Testing System (IELTS), including the academic writing and academic reading modules. A minimum score of 5.0 is required for admittance. An official transcript indicating completion of an Associate of Arts or an Associate of Science degree from a regionally-accredited U.S. college or university. An official transcript indicating a grade of C or higher (2.00 on a 4.00 scale) in an English composition course from a regionally-accredited U.S. college or university. The course must be equivalent to U.S college composition and the class must have been completed within the last (2) years. An official transcript indicating the applicant has passed the U.S. General Education Development (GED) test within the last five (5) years. An official transcript showing completion of a baccalaureate or master’s level credential from a regionally accredited U.S. institution with an overall GPA of 3.50 (on a 4.00 scale) or higher. All scores or transcripts must be sent directly to CSU-Global directly from the issuing organization. Photocopied, faxed, emailed, or unofficial documents will not be accepted.